What's rusting on your MP10's? I don't think I've ever seen one rust. I'm getting some rust-like coloration on the ceramic impeller of both of my MP10's. They're both about 5 years old now. I've seen a little discoloration on my older ones but it didn't look like rust to me...maybe I should look again! The shaft underneath the sleeve looks like stainless steel. Tank is looking amazing, really nice job . Boys n girls. The tank continues to progress downwards. My 1 year old birdsnest colony has STN'd pretty badly, and I have a nice layer of cyano covering my sand in the foreground. Furthermore, I've lost the pink Milli minicolony and the SPS are overall slowly losing coloration and polyp extension. I am near my wits end with this tank; a year ago, I could do anything I wanted and my tank would still thrive. 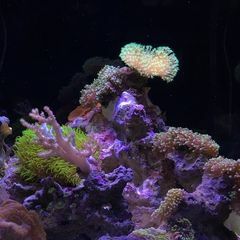 Now, I can't seem to keep any hard corals alive despite tight maintenance and testing. I will give this tank 2 more months before a complete tear down and restart. I dosed chemiclean 1 night ago, and tonight will mark the end of my first treatment. I subsequently plan on performing a 5g water change, and run another treatment of chemiclean (given the cyano still present in the display and frag display section in the sump). From this Thursday to next Thursday I will perform daily 5-10 gallon water changes with a new bucket of salt, to provide the tank with completely fresh water (in case there is contamination in my salt mix). Then I plan on dropping down to weekly 5g water and carbon changes weekly. If this doesn't help things turn around, it might just be time for a complete restart. For those of you who are still following my thread, things have somewhat come around with the STN after the massive water changes. Chemiclean made no dent on my cyano. I also picked up a 4 Bulb 24W ATI Powermodule (Oldschool) with a Reef-Brite Tech Strip from a fellow local reefer for dirt cheap. I think I'm gonna run it over display instead of my duo. Any recommendations for bulb combinations? On a great note, I also have a 17x10x9H Rimless tank, which I plan on plumbing into my system. I'll run it as the SPS exclusive frag tank, lit with a duo. I'll also keep the sump-frag-compartment running as well and use it for LPS/Zoas. Here are some pics! With the Nanobox Duo @ 100 blue, 40 whites, I was getting about 150 PAR @ sandbed and about 250 PAR at SPS. I'm running 2x Coral + and 2x Blue + in the ATI. I'm getting 240 PAR @ sandbed and 300-390 PAR where the SPS are mounted. Here are some pictures of the casualties/result of the STN episode. Good bulb choice combo, I would go the same with with 4 bulbs. I think you'll be really happy with the ATI, T5s rule. I love the coverage, a lot of shadows have disappeared since I mounted the T5s. I actually feel like the bulb combo might still be a bit blue, any suggestions for a whiter spectrum? B+, Aquablue Special, and 2 C+? I have the T5s on for 5 hours a day right now to acclimate the corals. I'm surprised at how much I like the light. It provides even-spread of light. I love the spectrum as well. ABS will add more white yes. You could try it and see how you like it. I don't have any experience with that bulb to give a definitive answer though, sorry. I ended up going with 2 Coral + on the outside, and a Gieseman Super Purple and a B+ in the middle. I love the spectrum it produces. Finished making my in-cabinet SPS grow out system. You literally always have the cleanest tanks,even in its worst days it looks 100000x better than mine,kudos !! "Cleanest"; the camera doesn't pick up the cyano on my sandbed, nor the hair algae on my rocks! I've got a interesting phenomenon going on in my tank right now. My sandbed gets covered with Cyano from 7AM-12PM. But when my lights come on at 12PM, the cyano starts receding, and by 6-7PM, the Cyano has almost completely broken up. Typically Cyano disappears overnight, but my Cyano is disappearing when the lights turn on. Anyone else experience this before? That is the oddest thing I have ever heard in my life. I have never heard of that. Yeah I'm so confused. Historically, I've had cyano disappear overnight and grow back during the day. Now it's only growing from 7AM-12PMish. I'm still slowly increasing my photoperiod, so I wonder if it'll continue receding as my photoperiod increases. Tank is plugging along. Corals are slowly recovering, still waiting for my alk consumption to rise enough for me to start dosing. Cyano is receding as well. I'd give ya some if you were in Iowa. I've given away about 7-8 big ol rics this year. that a nice gesture. I live in Jersey unforunately ? 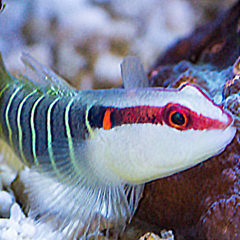 Meet goopy, my panda goby. I've had him for about a month now, in the frag compartment and subsequently frag tank. I haven't ever seen him eat, but he's somehow still alive and well. He's the size of my finger nail. That is awesome,I just got a yellow one and 2 days later he was gone,no body or anything.. kinda salty about it. That's what I fear every day when I look into the tank. Every once in a while, I won't be able to find him, and I'll be like "well he's gone..."
I do agree! The thing I love the most is how small he is. He's literally the size of an overgrown amphipod.